I’ve made a lot of progress in the patio gardens. This galvanized garden, or at least that’s what I call it, is filling out nicely. I go out each evening and see if I need to dead-head flowers or snip a bit. Don’t let your plants get leggy. Cut them back and they will start to show more bushy growth. If I hadn’t been cutting these back regularly, they would be five feet tall by now. Charlie Ross having a little rest. You can see my bad groom job. Found out I was going the wrong way with the clippers. I think I may need to take them back to the groomer who will give them a more professional cut! I have cut back these herbs quite a few times, and they just keep growing like crazy. 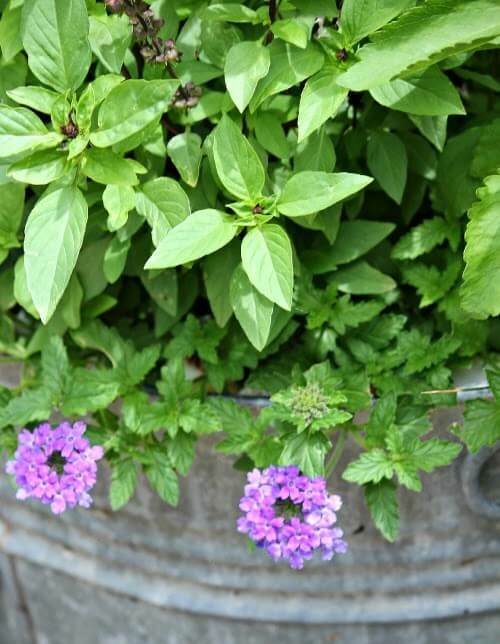 A mixture of both flowers and herbs in a container has always looked very pleasing to me. And the different scents mixing together is a great reason to mix them. Abi’s having a little herbal snack. They go right for the herbs. And that’s okay. 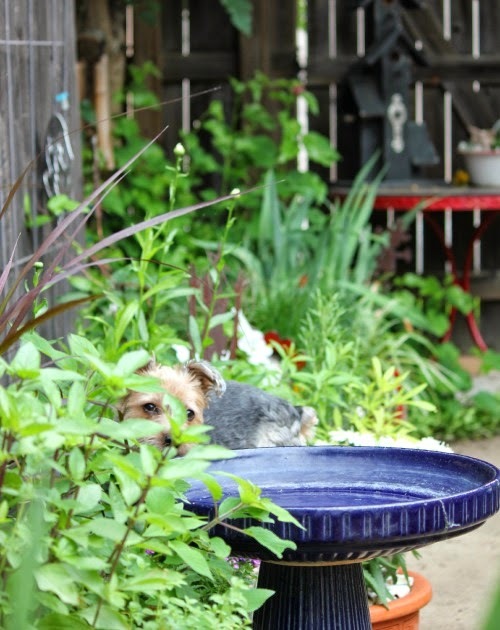 Most herbs are just fine for dogs to munch on. However, make sure you read up on them before you put them where your dogs can nibble on them. You don’t want them to get into something toxic. Then she jumps up in this one particular pot and chomps some more. I love this solar light my friend Charlotte, who is a reader, sent to me. 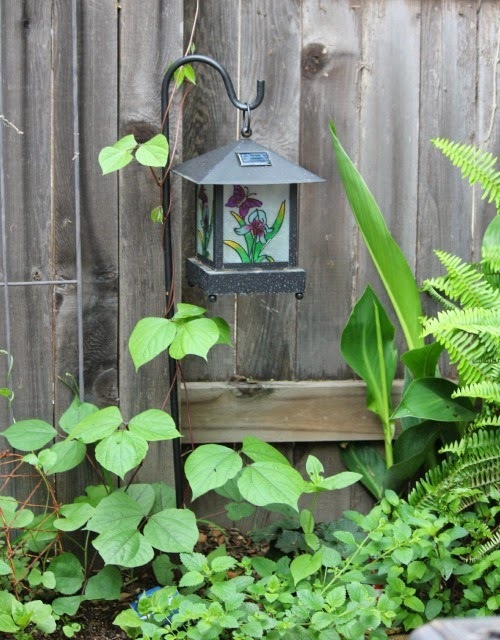 As you can see, the hyacinth bean vine is rapidly growing up it. Mr. Sun looks pretty lonely now. But in a few weeks, he will have the company of vines. Morning glory vines are growing up the trellis among the callas and petite petunias and various herbs. So you see, you can grow lush gardens in containers. All it takes is minimal maintenance and water. It has been raining, so that helps. Don’t discount a container garden over those in the ground. They can be just as pretty and much easier to care for. 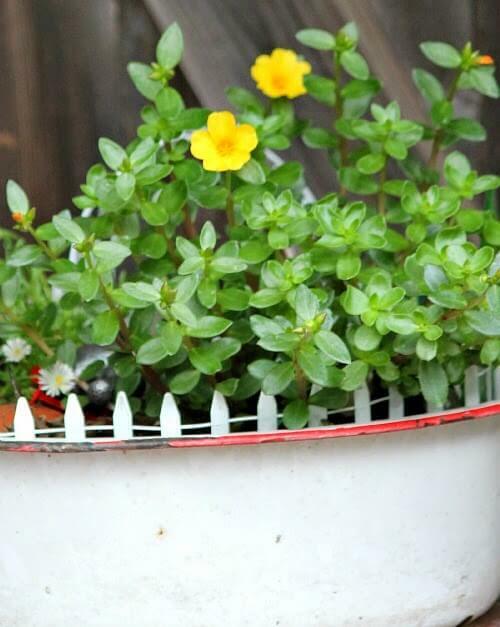 Your garden containers look awesome – and good advice – we can easily make beauty we e're we go, yes? I always think of those amazingly lush rooftop gardens in the heat of the huge Concrete Jungle Cities – if they can do it we certainly are able to do so as well! I love Charlie Ross lounging – so cute straddling that chair's cushion, so adorable. I know. It kills me how he straddles that thing. Abi doesn't do that. I'm happy that you're enjoying your lantern. It will be so nice with the vines around it.. I love mine. I made your beef/noodle dish yesterday.. I'm still getting compliments from my son.. Will surely be making it again.. It was so easy and was/is delicious.. Your patio is lookin' good. It has not been that long and it is already getting more lush and things are filling in. I hope you are taking some time out every day to enjoy it. Have a nice Sunday. Yes ma'am, I surely am! I go out there each morning and evening and just enjoy gazing at it. These kind of gardens are great for those of us who are aging, those that are handicapped or in a wheelchair, etc. Containers make it so easy. No weeding or digging. 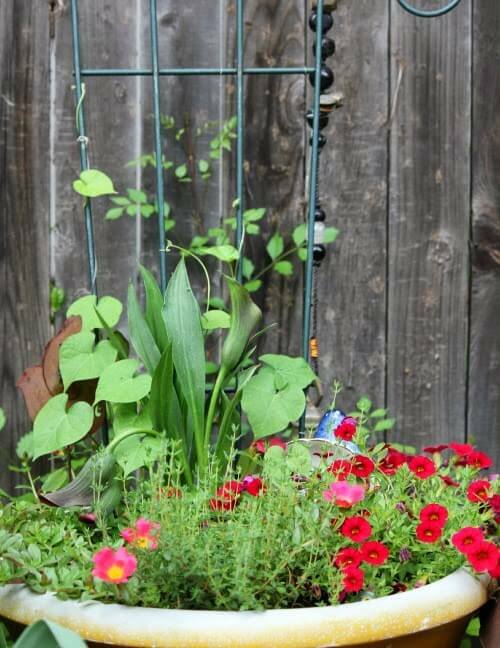 Love, love, love them all, especially the morning glory, callas, petunia, and herb grouping – so bright and bubbly! I've started…but haven't finished. Soon, I hope! Thanks for all the great tips; your green thumb has made its mark! I think my green thumb stems from true love of nature and plants. I've always loved them. Wow! It really looks nice Brenda. Manageable too. I have tomatoes, peppers, jaapenoes, onions and chives in pots. It is so much easier to manage. You've done a great job! Oh, much easier to manage. I don't think I'll be digging a hole with a shovel ever again. I've always been afraid to trim plants back, but will do so now! In a few weeks we won't recognize that patio at all! The neighboring botanical gardens will be coming to you for advice! 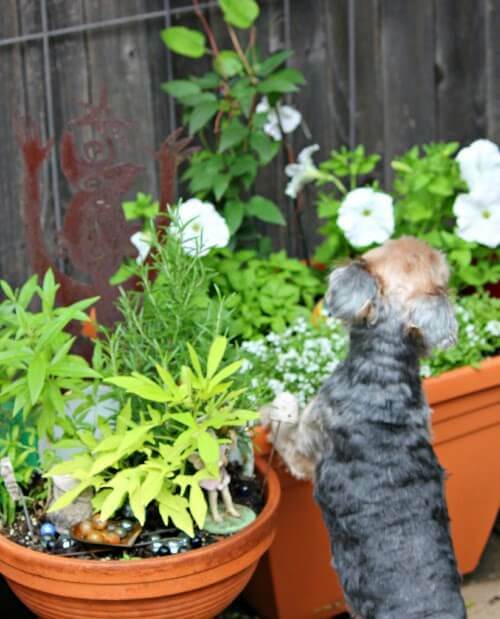 What herbs are the dogs eating? They like the pineapple sage and lemon verbena. And it's lush because I keep cutting the top growth. Your garden looks charming – a treat in every direction! And it will just keep getting better and better! So much easier to take care of in containers! 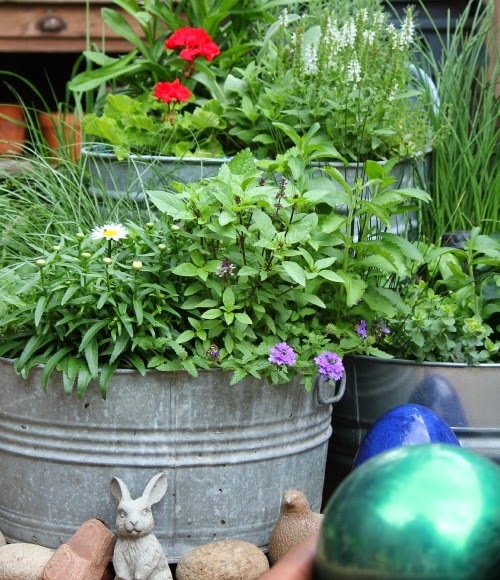 Your containers garden is so pretty!! I love in ground gardens. But I think I'm liking the containers gardens even better because it's just so much easier. Look at the expression on Chatlie Ross' face! Isn't he something! Absolutely amazing patio garden! All of your plants and flowers are so lush and healthy looking. I sure wish I had your touch. I always enjoy photos of your adorable pupsters. 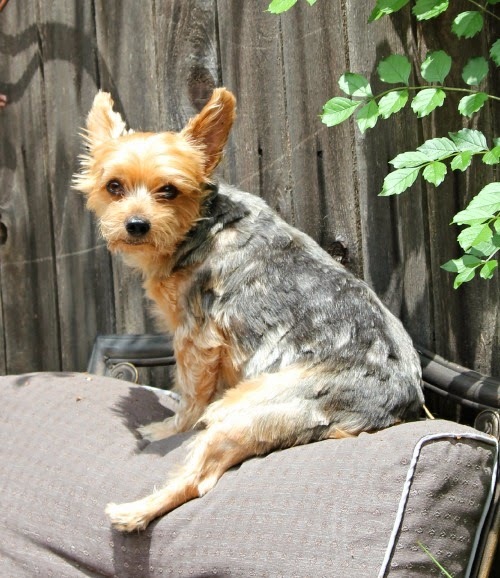 I love how Charlie is sitting on the back of a chair. So cute! I don't how he manages to straddle the chair cushion. But he does and looks quite comfy. I just want people to understand that no matter where they reside, they can have a garden of some capacity. Your patio looks so good Brenda! I love all the herbs. And the thing is, I hardly do a thing. Water some, prune some. Mostly just enjoy them. I can hardly believe what you have done on your patio in this small amount of time…You truly amaze me Brenda..also thanks for the tip about trimming plants back..now I know what I need to do with the ones that get long and overgrown looking..and of course the pups are always adorable.. I just cut at the top of a set of leaves. Don't know if it's the correct way or not. But mine don't seem to be complaining. That gives it a more natural look. I guess it can be said that I "container garden"…even though we have 4 acres. I found out about 3 years ago– it is so much simpler to grow our veggies in bed boxes, rather than straight in the ground. There weeds are fewer and it's easier to manage. I've also found that having some plants in baskets (hanging) some in pots …or any other container…makes for a much more interesting garden. I have my veggies growing right in the front yard now– for years NO grass has grown there and the dust and dirt made a mess inside and out…I built the bed boxes out front, there is a variety of SUN AND SHADE spots for different plants and we've been successful with having veggies–the bonus is, no more dust! So it can be said– that just because you have the space to grow a garden doesn't mean you can't do it a box (ie: container instead) You should grow some veggies, girl! You're so right, Pat! Even if you have an abundance of land, it might be clay soil or not hospitable to what you want to grow. With containers, you can add the type of soil you want. And an added bonus is that if one is getting too much sun, you can move it! Can't herbs be classified as veggies??? I suppose so– you can eat them. Heck! You can even eat some of the flowers you have planted–and some of the roots of others! The container gardens look great. And I don't use fertilizer. 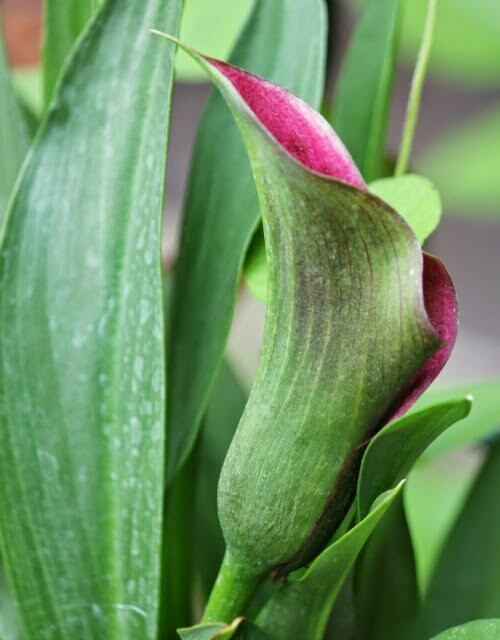 I can tell from the tone of your post that gardening gives you great pleasure, and I think your plants know it ;). They are so pretty together! Just make sure you get plants tolerant of the same amount of sun, etc. 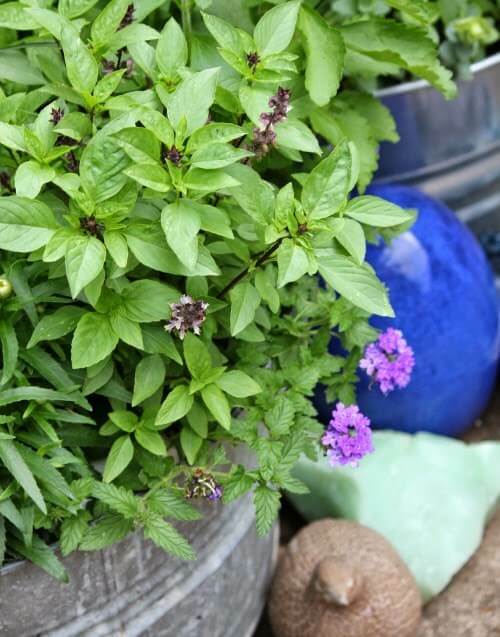 Most herbs like at least 6 hours of sun. Everything looks beautiful, Brenda! You know, you can also grow potatoes in a large pot! I know you and the pup-stars love those. Can't wait to see the vines growing up the fence. I bet you really enjoy being able to sit out in your refuge and enjoy the quiet. Did you ever figure out a way to have a fountain somewhere? They make solar ones now, too….no cords! Enjoy your garden!! Can you sit out during the day, or is it already too warm? It's not the warmth that bothers me as much as the humidity. No, didn't figure out how to use my fountain yet. Just sitting out there on the potting bench. I have two big clear plastic containers. Wonder if I could just put holes in the bottom and grow potatoes there? I love looking at your patio container garden. I think it's more beautiful than any I've seen cause you're so inventive. Who would think to put morning glories in a container, for example? 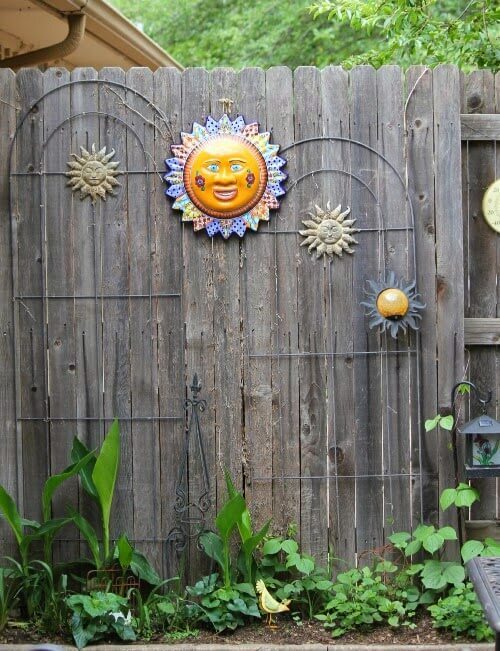 Your creativity would be great for a book or at least a garden magazine feature…..good work! Like I always say: Just think outside the box. Your containers look wonderful with all the variety of plants and herbs! I found a "Sun" wall plaque at a garage sale last week that had a broken piece off one section of the rays – but heck, it was only 10 cents!! His smiling face will soon be peaking out of vines and the broken part covered anyway. Who doesn't love a bargain for garden yard art! Everything looks so lush and gorgeous! You obviously have a very green thumb:) I'm hoping my next apartment has a little outdoor space. Gosh, I envy your green thumb!